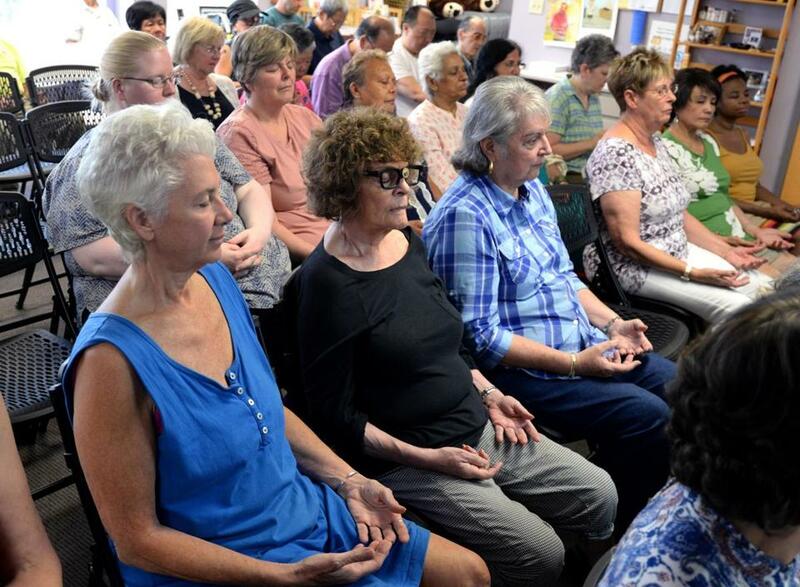 At the Oriental Culture Institute in Quincy, a group gathered for a Tong Ren energy healing class, including, from left, Carol Huang, Georgia Contes, Julie Kalustian, Richard O&apos;Connor, and Chuck Christian. There are 50 of us here participating in a Tong Ren class at the Oriental Culture Institute in Quincy. Suzanne Kroll has driven from Worcester. Elaine Harmon, who lives in Hyde Park, Julie Kalustian and her mom, Georgia Contes, Arlington residents, and Chuck Christian, from Randolph, had shorter commutes. Sometimes, the free weekly classes include people from across the country or around the world. A woman from San Diego stayed for two weeks. A young man from China was here for three months. Most of the people who take such classes are gravely ill. Many have late-stage cancers, metastasized to organs and bones, and have been told by their doctors that modern medicine has nothing more to offer. Some are struggling with Parkinson’s disease, multiple sclerosis, or depression. But when Tom Tam, the class leader and inventor of the Tong Ren energy healing system, takes the stage and begins cracking jokes in his imperfect English, the mood is upbeat, and there is so much laughter it’s easy to forget what has brought the group together. Class leader Tom Tam, inventor of the Tong Ren system, showed one of his healing machines. Kroll, who is middle-aged, had lung cancer and has been dealing with a recurrence in two lymph nodes. Harmon, 65, and cancer-free for more than a year now, had two uterine cancers, ovarian and sarcoma, at the same time. Kalustian, 51, has an aggressive form of leukemia but continues to bring news of striking improvements from her lab reports. And Christian, 58, has stage four prostate cancer but has been stable since he began attending classes and receiving acupressure and acupuncture treatments more than a year ago. I’m here today to observe and report. But I’m not an outsider; I’ve had cancer, too. 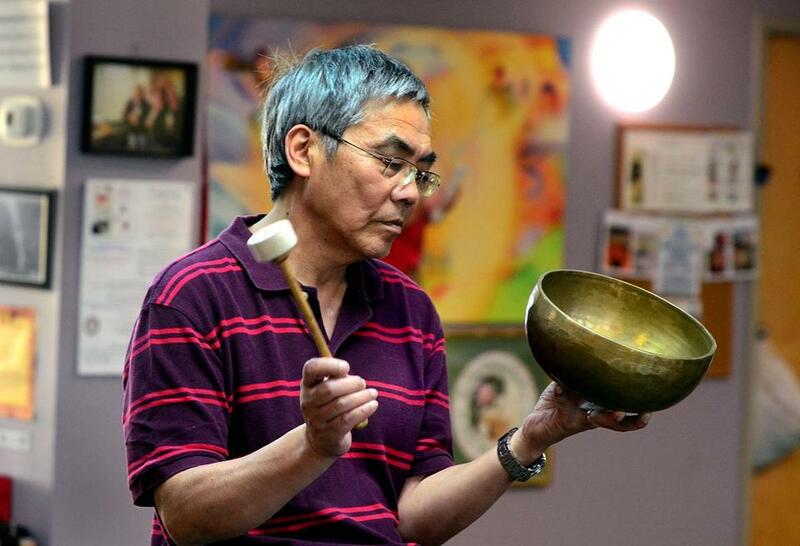 For the past four months I’ve been driving across the state to attend Tong Ren classes in Quincy, Haverhill, Groton, and Burlington, four of about two dozen locations from Western Massachusetts to Cape Cod where they are held weekly and attract roughly 800 people. A Tong Ren class may seem strange the first time you go. But when you see Tam or a class member tapping fervently with a magnetic mallet on a 10-inch plastic human anatomy model, you might begin to see that this healing system, which some skeptics have compared unkindly to a kind of voodoo therapy, is more than what meets the eye. A Tong Ren healer tapped on an acupuncture doll with a metal hammer, calling out letters and numbers for the pathways associated with specific organs of the human body that are imprinted on the model. Aside from the tapping, the components of Tong Ren — which literally means “bronze man,” a reference to the original Chinese acupuncture model — also include acupressure, acupuncture, and, its proponents say, group intent or energy. Tam, who is 67 and a survivor of China’s Cultural Revolution, jokes that he’s a “lazy bum” and encourages others to take it easy, too, emphasizing that relaxation is the first step toward healing. But he doesn’t seem to take his own advice: In more than 30 years of practicing acupuncture and Tong Ren, he says, he has treated thousands of patients, working seven days a week, including holidays, and never canceling, not even during a snowstorm. 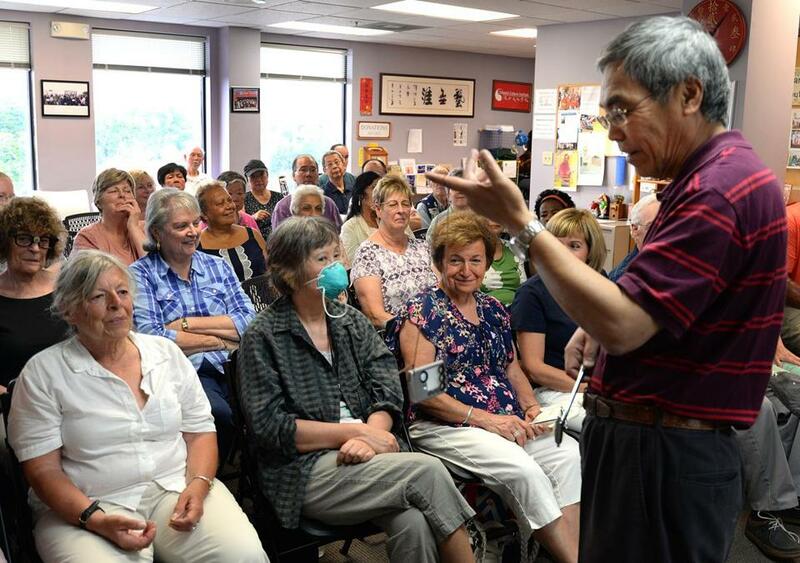 For years, in addition to conducting his classes, he has treated 40 to 50 paying patients a day in his Quincy and Boston offices; on occasion, he has posted signs outside that say, “Please, no new patients,” written in Chinese, Russian, and English. His patients include the rich and famous, he says, as well as the homeless. In his eyes, everybody is the same, every person counts. At times, class participants kept their eyes closed with their hands on their laps and palms facing up. Tam has taught his theories and techniques to medical doctors in Italy, Buddhist monks in upstate New York, and rabbis in Brooklyn. His daughter, Yvonne Tam, an acupuncturist who works with him, says there are now about 1,000 Tong Ren tappers worldwide. When Dr. James Street, the head of anesthesiology at Emerson Hospital in Concord, was diagnosed with cancer three years ago, he used acupuncture and Tong Ren as complements to standard treatments. “To me, Tong Ren was a natural extension of acupuncture, closely related,” says Street, who also serves as medical director of the Emerson Wellness Center for Mind and Body, a community program where several hundred people have attended Tong Ren classes since they were added three years ago. Tam says he is eager to share his work with medical doctors. But, so far, there have been few takers. 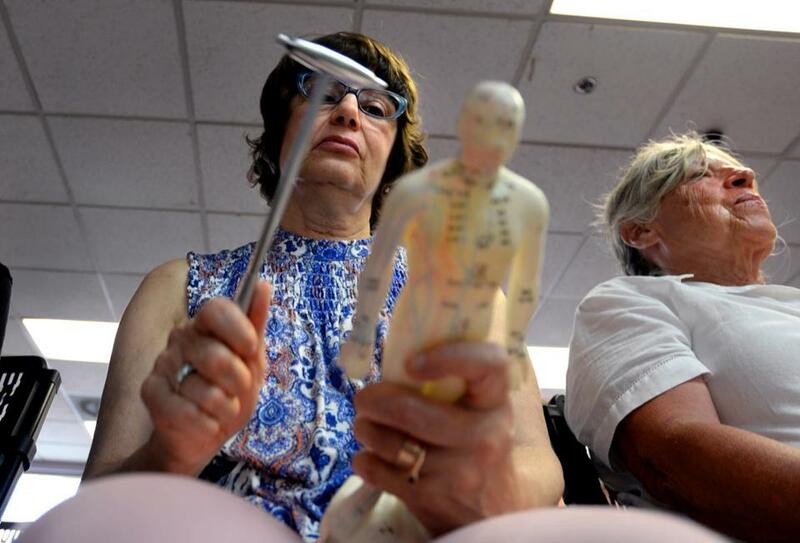 Mind-body programs at Dana Farber and Brigham and Women’s Hospital offer traditional acupuncture and other complementary therapies but no Tong Ren, said hospital officials, who declined to comment. But no matter, say believers of the system. “A lot more science needs to be discovered to understand these healing modalities,” says Tufts University biophysicist Michael Levin, a patient and friend of Tam’s for 30 years and head of a lab that is among a handful worldwide studying electrical communication among cells in regenerative medicine, developmental biology, and cancer. 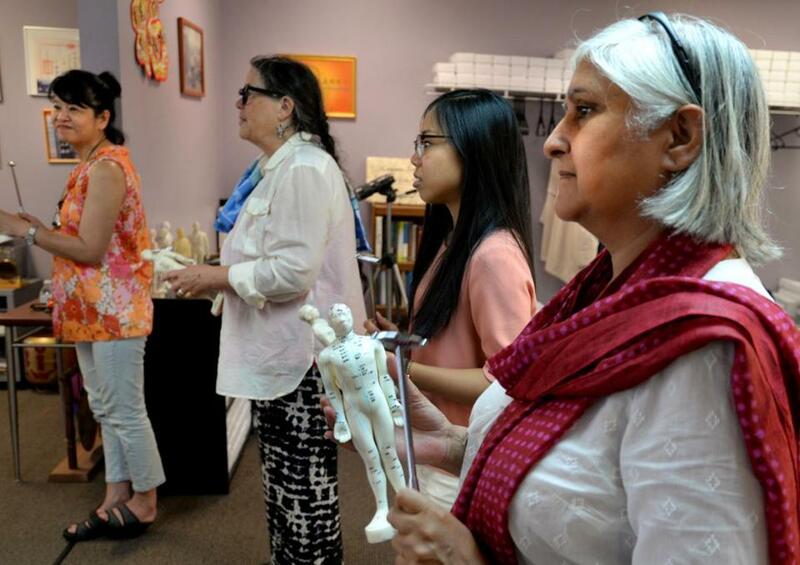 Hardeep Mann, far right, and others in a Tong Ren class in Quincy in July. 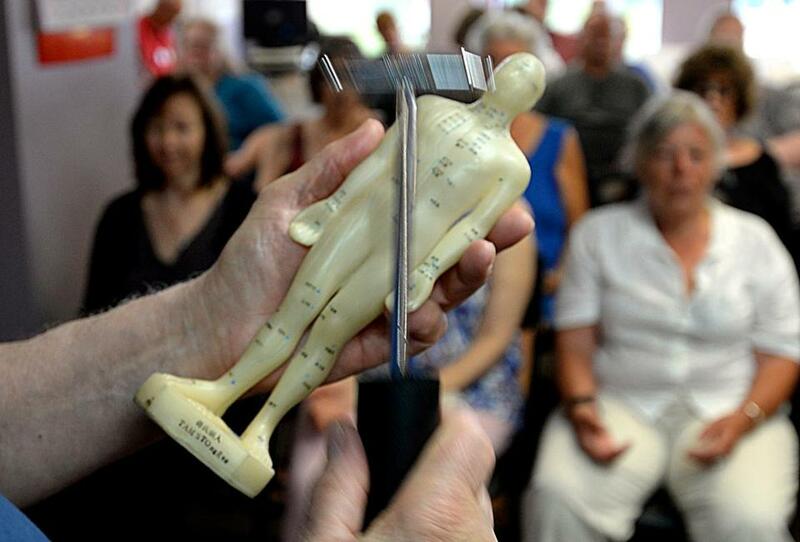 Inside the Quincy classroom, Tam continues tapping, assisted by volunteers and class members who brought their own acupuncture models and mallets. “T1, T2, T3,” he says, calling out anatomical points on the model as he taps on them. In his book “Healing Cancer with the Nervous System,” published in 2012 by the Oriental Culture Institute, Tam asserts that an out-of-balance nervous system can wreak havoc on one’s health. His healing approach is based on the idea that the bioelectricity and biochemistry that power our cells are both essential to health. While Western medicine has focused mostly on biochemistry, he says, Tong Ren centers on bioelectricity and how interruptions in the flow of blood, oxygen, and nerve impulses to the organs can cause disease, including cancer and autoimmune and neurological disorders. Harmon is vigorously tapping, keeping time with Tam and his backup tappers. She has weathered surgery and chemotherapy with acupuncture and three Tong Ren classes a week, beating the odds with no side effects. Elaine Harmon, of Hyde Park, kept up with the tapping. A woman who had pancreatic cancer says her latest tests showed no trace. A man with amyotrophic lateral sclerosis, ALS, isn’t here because he’s taken up golf. Kroll, from Worcester, relaxes in her chair, hands on her lap, palms up, eyes closed as light as butterflies. Lying in the positron emission tomography, or PET, scan machine at Mount Auburn Hospital a few weeks ago, she calmed herself by imagining this scene. Next to her, Harmon pounds on her doll as if someone’s life depends on it. Several seats away, Kalustian, Contes, and Christian are doing the same. Up and down the rows, healing energy flows like a river, powerful, deep, and wide enough for all of us to dip our toes in.